Six teams battled it out in the final of the University of Plymouth FLUX competition, with one of the UK’s Top 100 Undergraduate Employers, Enterprise Rent-a-Car, setting a real-life challenge to test students. Covering everything from PR stunts to target markets, teams of six discussed, planned and presented their strategies to launch the company’s Car Club concept, which has already taken off in more than 25 UK cities, in Plymouth. "When the University of Plymouth asked us to support the FLUX competition we were more than glad to take part, knowing that it would help students develop core business skills and sound commercial awareness." Enterprise Rent-a-Car Talent Acquisition Specialist, Emma Barnes. 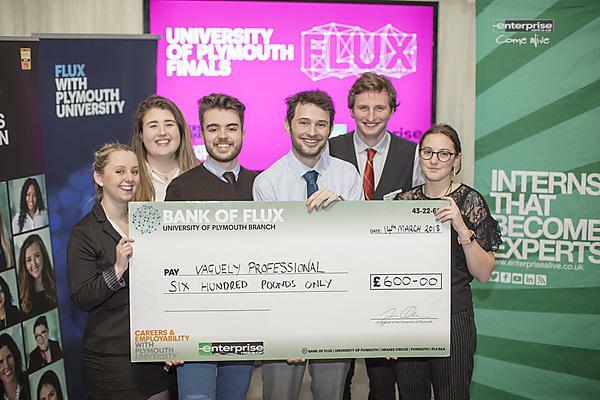 After deliberations by a judging panel made up of Enterprise managers and experts from a range of local and national businesses, Vaguely Professional – a team of Tourism, Hospitality and Cruise Management students from Plymouth Business School in the Faculty of Business – were named the competition winners and University FLUX Champions for 2018. FLUX is a fast-paced competition in which an employer sets a real business challenge for teams of commercially-minded students to resolve. This year’s final saw five teams from the Faculty of Business and one from the Faculty of Science and Engineering competing for the title. Vaguely Professional earlier finished second in the Faculty of Business round of FLUX, but went one better to claim the title in the University-wide final. The team was made up of Kieran Fowler, Harry Burgess, Amy Spink, Eleanor Oakley, Michael Caldwell and Katharine Curnow. University of Plymouth FLUX marked its 10th anniversary this year, continuing a long and illustrious tradition in the contest. When FLUX was a national competition, teams from the University beat all comers to take the title five times in eight years up to 2015. "It was an excellent opportunity to return to the FLUX competition, sitting on the other side of the table! I really enjoyed FLUX as a competitor, and enjoyed the opportunity to give back some of my experience and knowledge to the students." Teddy was joined by experts from the Chartered Institute of Marketing, Nash & Co Solicitors, University of Plymouth Students’ Union (UPSU), Babcock International Group, Numbers UK and PwC, all providing the students with individual feedback and supporting them in developing employability skills. "When the University of Plymouth asked us to support the FLUX competition we were more than glad to take part, knowing that it would help students develop core business skills and sound commercial awareness. "Participants took on the Enterprise Car Club Challenge, with the top team winning £600, but more importantly a great entry into their HEAR (Higher Education Achievement Report)."